The Morristown Church of Christ began in 1938 with just a few families. Since that time, the church has met at three different locations, and each move was the result of the church's continued growth. We currently meet at 1408 East Andrew Johnson Highway in the building shown to the right. It was built in 1983 and continues to bless our church family with the opportunities that have helped us be who we are today. As times change and the church grows, we recognize the importance for our physical facilities to meet the spiritual needs of our members and the community. In 2012, the elders sought the services of Brewer, Ingram & Fuller Architects to help us envision the future for our building. After several months of meetings and discussions, they proposed the design as seen in the picture below. The structure in the upper right-hand corner of the picture is an additional multi-purpose facility and new entryway. 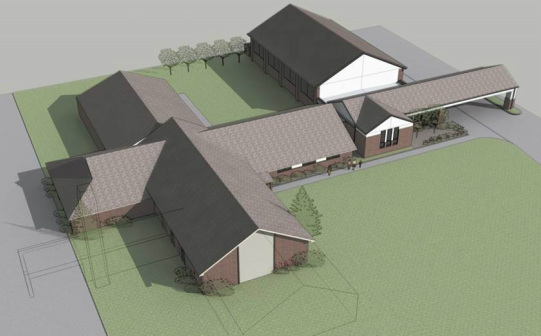 This addition would allow for greater fellowship among our church family and more effective outreach into the community. Its design would also allow for larger worship gatherings and more space for classes. 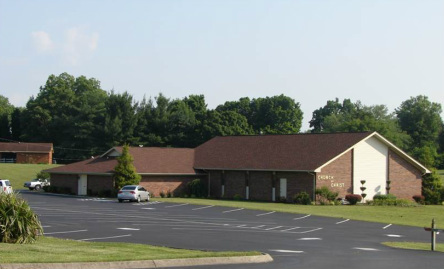 At Morristown Church of Christ, we do not believe that the church is a building or is even about buildings. However, we see buildings as resources. The more usable our physical facilities are, the more we will be able to fulfill God’s vision for us here. The more usable our physical facilities are, the more we can reach others with the good news of Jesus Christ. A Building Fund is now in place so that this addition can become a reality as soon as possible.